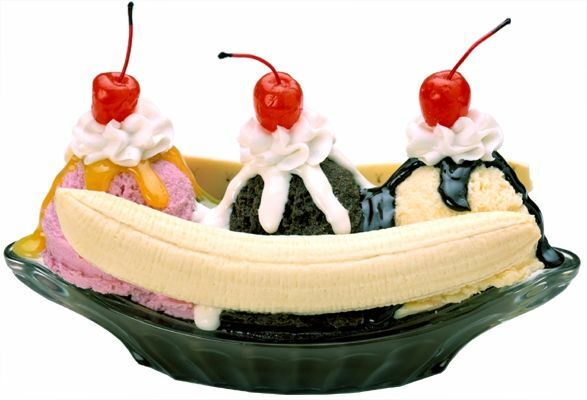 August 25 is National Banana Split Day. According to some sources, the banana split was first created in 1904 by a pharmacist named David Evans Strickler in Latrobe, Pennsylvania. Others dispute the claim. But in August 2013, Latrobe erected a commemorative marker with great fanfare at a banana split festival, so it must be true. After all, a sign says so. In Latrobe, Pennsylvania, citizens celebrate banana split history and erect a marker staking the city’s claim as the birthplace of the banana split. The show featured a fictional rock band composed of Fleegle (a beagle), Bingo (a gorilla), Drooper (a lion), and Snorky (an elephant). It was produced by Hanna-Barbera Productions with costumes and sets designed by Sid and Marty Krofft. Tra la la, la la la la. Tra la la, la la la la.